A day to remember everyone who is suffering or who has ever suffered from Severe and Very Severe Myalgic Encephalomyelitis. 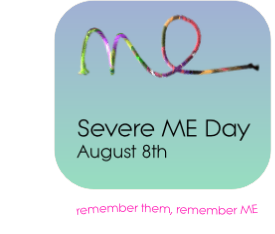 Severe ME Understanding & Remembrance Day : This day aims to bring public attention to the illness for the sake of all those presently suffering from Severe Myalgic Encephalomyelitis and to remember all those who have died from ME. A day to honour the strength of spirit of all those who have endured and continue to endure decades of suffering and profound physical dysfunction and yet receive little, or no recognition or help, but rather continue to experience gross misrepresentation and misinterpretation of their illness and profound disability.